When I plan my trips abroad, I not only check the sights, nature or art, but I also go to local football spots to check if a game is on! I believe in emotions and a match releases plenty of those. It helps me understand locals and that is my top reason for travelling. That is why I decided to share with your tips about football in Prague. On the picture is the ‘Sparta‘ stadium, one of top Czech teams. When they play with ‘Slavia‘, prepare for an interesting match. 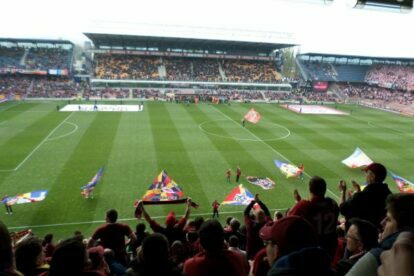 There are other popular teams in Prague – Bohemians 1905, Dukla, Viktoria Žižkov, and others, but only Dukla and Bohemians 1905 are in the first league together with Sparta and Slavia.